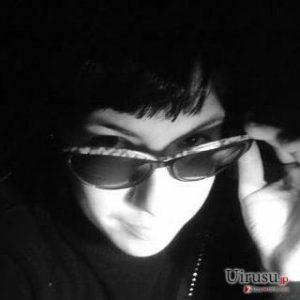 Disspy, originally developed by Disspy.com and acquired by H-Desk.com, pretends to be a powerful anti-spyware solution. We have carefully tested free version of this product on several computers. 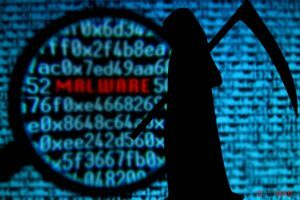 The application performed well and detected most installed malware. The program comes in two flavours: Lite edition and Professional edition. The latter includes three additional features – the real-time monitor, deep scan and trojan guard. Disspy Pro checks the memory, Windows registry, cookies and entire file system. Deep scan feature allows to thoroughly examine files content. Spyware definitions database included in free version is a way to small and quite outdated. It includes signatures associated with 251 parasite, only 37 spyware programs are amongst them. Note that reputable anti-spyware products use far more extensive databases, which contain signatures of thousands of different pests. Real-time monitor is very effective. It detects suspicious processes immediately after they start. The graphical interface is intuitive and user-friendly. Program vendors decided to call free version a trial. We cannot agree with them. The real trial should provide all the functions available in full version, but work only for limited time. However, tested free Disspy version refuses to remove any malware it found and asks to register and purchase full product. Even spyware database updates are disabled. 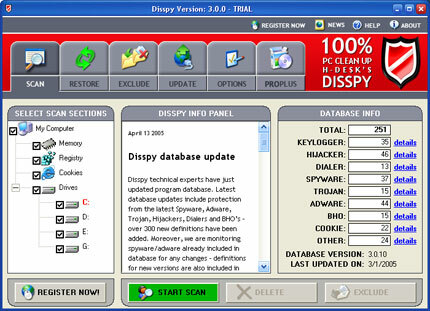 Domains associated with Disspy are disspy.com and h-desk.com. Registration and orders are made via secure connection. This entry was posted on 2014-05-10 at 05:19 and is filed under Anti-Spyware, Software.